I bought some fresh Mahi Mahi yesterday and brought it home and marinated it in Gourmet Warehouse Key Lime marinade, to which I added some lime zest and balsamic glaze. I only used about half the bottle. The other half is marinating some boneless chicken breasts for another night. The sauteed Swiss chard, carrot, with Cannelini and Zatarain’s Cilantro Lime Rice mixed with brown and wild rice were the perfect accompaniments. Put the fish in the marinade as soon as you bring it home. Start the rice about 40 minutes before you want to eat. Place ingredients in rice cooker and cook. Marinade fish at least 30 minutes. Bake at 350F for 20-25 minutes depending on thickness. So ideally, this gets put in the oven about 15 minutes in to the rice cooking. As soon as you put the fish in, start your veggies. Saute frozen carrots over low to medium low heat, till thawed and beginning to cook, about 10 minutes. Add in chard and cook another 5 minutes Add in beans and stir. Heat through about 5 minutes. Brown Cous Cous in oil until golden. Season. Add in frozen veggies. Add water as per vegetable directions. Add in beans. Simmer until vegetables are crisp tender. I cooked a roast beef in the crock pot tonight. 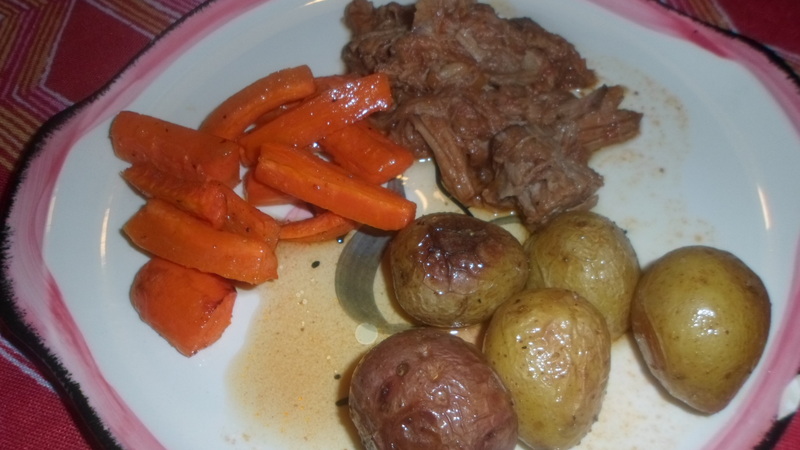 When I got home, I roasted some potatoes and carrots to go with it. Wash potatoes. Pierce with a fork and cook on a plate in the microwave for 6 minutes on high while preparing carrots. Peel and cut carrots into quarters and cut into bite size pieces. Put carrots in the same bowl and toss them with olive oil, salt and Cajun seasoning as well. Pour into second baking dish. Bake at 400 F for 20 minutes. My kids, who are not too keen on carrots, really like them this way!